SAN JOSE, Calif.--(BUSINESS WIRE)--Today, eBay and Shyp announced an extension of their shipping integration into the Los Angeles market to further help sellers from coast to coast get organized just in time for Spring Cleaning. Building on the success from initial pilots in New York, Chicago and San Francisco, the expansion will help equip consumers with an easy, optimized selling and shipping experience. Shyp will pick up the items you sold within 20 minutes, professionally pack them, and mail them straight to buyer on your behalf. Together, eBay and Shyp are solving one of the biggest pain points of selling online — shipping. Partnering with Shyp is another way that eBay is making the online selling process easier for everyone — from first-time, casual sellers, to small business owners and entrepreneurs. Shyp’s pickup and packaging fees will be waived for eBay sellers through June 30, so they can enjoy at-home item pickups and expert packaging free of charge, visit: www.ebay.com/shyp. Spring cleaning season is upon us, and studies have shown that on average, the American consumer has thousands of dollars worth of goods sitting unused around the house. With a global community of over 160 million active buyers, there is always an eBay shopper in search of the apparel, electronics, other household items, and one-of-a-kind items that you’re looking to let go of this spring. Now, with Shyp, you can take comfort in a quick & seamless end-to-end selling experience on eBay. Shyp will pick up the items you sold, professionally pack them, and mail them straight to the buyer on your behalf. 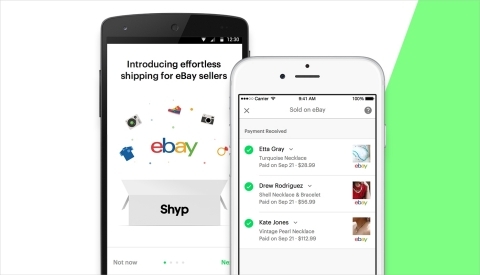 eBay sellers can connect their eBay account to the Shyp app to see an itemized feed of their recently sold items. They can then select items they’d like to ship, and request a pickup. Within 20 minutes, a Shyp courier will arrive at their door to take care of the rest. In addition to offering expert packaging, Shyp also compares prices across carriers to find the lowest available shipping rate on the seller’s behalf. Once picked up, Shyp automatically marks sellers’ items as ‘Shipped,’ notifies the buyer, and updates sellers with tracking info within the same day of a requested pickup. Simply download Shyp from the App Store or Google Play and sync your account to get started.